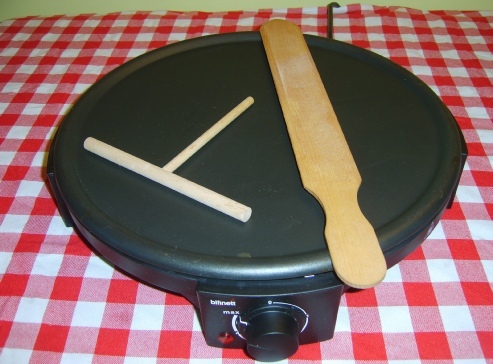 Once you have made the crepe (pancake) mix, you will enjoy trying to make a crepe on theses electrical mobile hot plates. The skill is to have the plate at the correct temperature to the mix! It may take a few attempts but the idea is to pour the mixture in the center of the crepe plate and quickly spread the mixture using the T-bar spreader until it as even as you can possible get it without it falling apart or off the edge. Anyway even if it does look at little odd the customers (and staff) will admire the effort and the end result, especially when it has their favourite fillings. Fully adjustable thermostat with operating light. Comes with Spatula and batter spreader. 340mm diameter cooking area. 240 volts. 1420 watts. 6 amps. 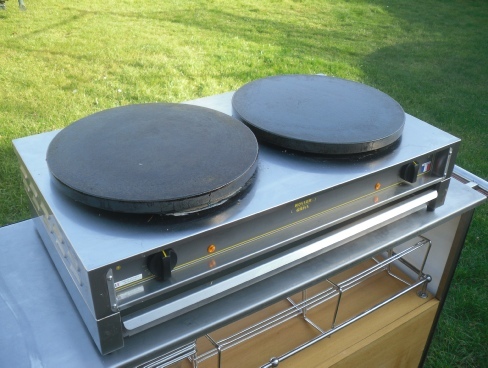 Professional Commercial Twin Hot Plates: 400mm diameter cooking area, 230v. 6000w. 26 amps. Alexandra Palace, Business Design Centre, Bournemouth International Centre, Donington Exhibition Centre Donington Park, Epsom Downs Racecourse, ExCeL, Earls Court, G-Mex Centre, Hilton Brighton Metropole Hotel, Manchester Central Convention Complex, Novotel London West, The NEC, National Exhibition Centre, Olympia, Queen Elizabeth II Conference Centre, Ricoh Arena, Sandown Park Exhibition and Conference Centre, The O2 Arena, Stoneleigh Park, Telford International Centre, The Brighton Centre, BDC, Cardiff International Arena, Old Billingsgate, The Royal Armouries Museum.